Physician Burnout has long been discussed in the medical literature and more recently in the mainstream media. Today it is well recognised as a condition that is not only detrimental for the physicians but also puts patients at risk. Physician Burnout has been described by Dike Dummond, author of The Happy MD blog, as different from every day stress, and is something that “begins when you are not able to recharge your batteries between call nights or days in the office.”  It can then result in physicians developing a negative attitude towards their patients, and a reduced sense of satisfaction in their work. The 2016 Medscape Lifestyle Report  – which surveyed 15,800 physicians over 25 specialties – reports that levels of physician burnout in the US have reached ‘critical levels’, with too much administration, too many working hours and increasing computerisation being the main causative factors. Increasing administrative duties, the pressures of an NHS in crisis (in the UK at least) and new ‘24/7’ technologies that blur the line between professional and personal time, have created a perfect storm for this rising epidemic. This systemic review and meta-analysis of studies designed to identify and reduce physician burnout – 15 randomised trials and 37 cohort studies –“indicates that both individual-focused and structural or organisational strategies can result in clinically meaningful reductions in burnout among physicians.”  Individual-focused activities include mindfulness and small discussion groups, which enable physicians to recognise the early signs on burnout and act accordingly. 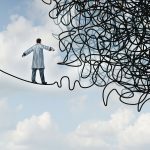 Furthermore, a recent blog published in Medical Economics describes why Physician Burnout happens, and touches on what doctors can do to reduce its impact,  including bringing in external help for burdensome administrative tasks and technological assistance.